PHILADELPHIA, Pa., Jun 11, 2018 (SEND2PRESS NEWSWIRE) -- The C Diff Foundation is honored to welcome 20+ leading topic experts joined by Dale Gerding, MD, FACP, FIDSA, Professor of Medicine at Loyola University Chicago Stritch School of Medicine in Maywood, Illinois and Research Physician at the Edward Hines Jr. VA Hospital and Mark Wilcox,B Med Sci, BM, BS, MD, FRCPath-, Head of Microbiology and Academic Lead of Pathology at the Leeds Teaching Hospitals (LTHT), Professor of Medical Microbiology at the University of Leeds, and Lead on Clostridium difficile for Public Health England (PHE). Dale Gerding, MD, FACP, FIDSA and Mark Wilcox, B Med Sci, BM ,BS, MD, FRCPath- will be this year's Conference Chairs of the upcoming 6th Annual International "C.diff. 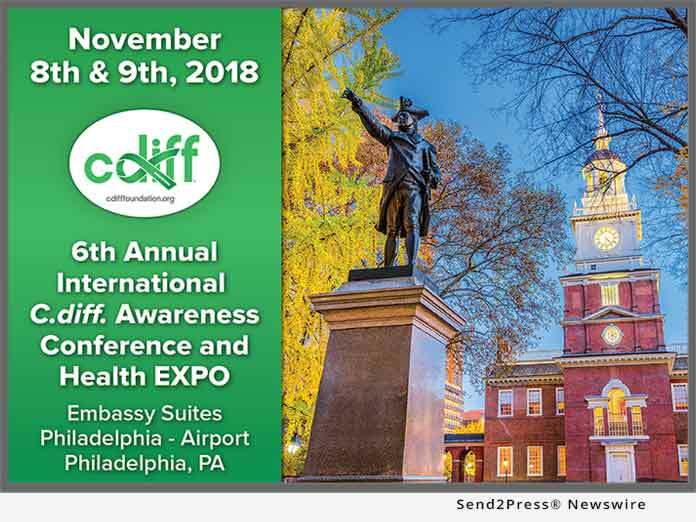 Awareness Conference and Health EXPO," taking place on November 8 and 9, 2018 at the Embassy Suites by Hilton Philadelphia Airport - Philadelphia, Pennsylvania. According to the Centers for Disease Control and Prevention (CDC), Clostridium difficile infection (C. difficile) "has become the most common microbial cause of healthcare-associated infections in U.S. hospitals and costs up to $4.8 billion each year in excess health care costs for acute care facilities alone." Statistics provided by the CDC suggest that C. difficile cause nearly 500,000 infections in patients in the U.S. annually. In one study noted by the CDC, among infected patients, nearly 29,000 died within 30 days of being diagnosed, and more than half of those deaths (15,000) were directly attributable to a C. difficile infection. Attendee Barley Chironda, Infection Control Specialist, said about the 2017 conference, "I have attended all of the C Diff Foundation Conferences and I am always in awe at the wealth of new information that is presented at each conference. As an Infection Control Specialist, and a person who deals with Healthcare Infections, I feel this conference allows great knowledge sharing and networking." - Silver: Mr. & Mrs. Angelo Ortiz. - Bronze: Honey Bee Handiworks, Trinity Guardion, Steriliz, Safety Net America, SporeGen. The C Diff Foundation, a 501(c)(3) established 2012, comprised of 100% volunteering professionals dedicated at supporting public health through education and advocating for C. difficile infection (CDI) prevention, treatments, environmental safety, and support worldwide. Listen to "C.diff. Spores and More" Tuesday's at 1 p.m. ET (www.cdiffradio.com), sponsored by Clorox Healthcare, providing leading up-to-date information on topics that are in align with their mission.